CARACAS: The first shipment of Red Cross humanitarian aid arrived in crisis-wracked Venezuela on Tuesday following approval from President Nicolas Maduro’s government, the organisation confirmed. “This is a great step forward to support vulnerable people in the country!” tweeted Francesco Rocca, president of the International Federation of the Red Cross and Red Crescent Societies. The shipment included 24 tonnes of medical supplies and 14 power units to be distributed amongst eight hospitals and 30 outpatient clinics — half of them public — said Health Minister Carlos Alvarado. Some 30 trucks moved the supplies from the Maiquetia airport to a Venezuelan Red Cross collection centre in Caracas, AFP journalists said. Some 3,100 volunteers will take part in the distribution of the supplies that arrived from Panama. Venezuela has suffered more than four years of recession marked by shortages of basic necessities such as food and medicine. The United Nations says a quarter of its 30 million population is in urgent need of aid. 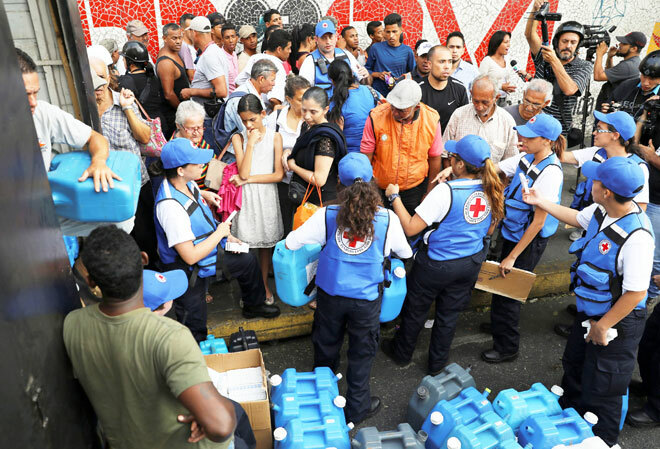 Last week, Maduro and the International Committee of the Red Cross (ICRC) came to an agreement to allow in the humanitarian aid. Public hospitals have struggled to treat patients due to shortages of antibiotics, bandages and respiratory equipment. The United Nations estimates that 3.7 million Venezuelans are malnourished and 22 per cent of children younger than age five suffer from chronic malnourishment.